IRS Form EIB-SBA2220, "Underpayment Of Estimated Tax By Corporations" is a tax form issued by the United States Internal Revenue Service. The latest version of the form was released in January 1, 2017. A up-to-date fillable EIB-SBA2220 Form in PDF is available for download below. The "Underpayment Of Estimated Tax By Corporations" can be filed digitally and submitted online or printed out and sent to the IRS mailing address. Attach to the corporation’s tax return. Go to www.irs.gov/Form2220 for instructions and the latest information. 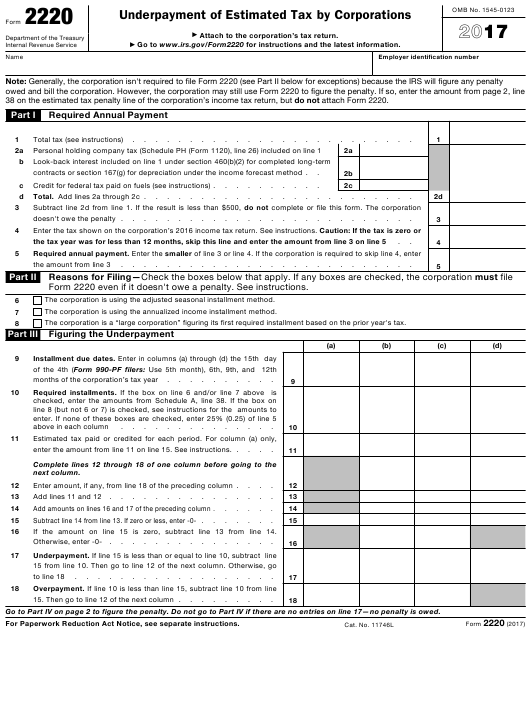 38 on the estimated tax penalty line of the corporation’s income tax return, but do not attach Form 2220.
contracts or section 167(g) for depreciation under the income forecast method . Credit for federal tax paid on fuels (see instructions) . Total. Add lines 2a through 2c . doesn't owe the penalty . Form 2220 even if it doesn't owe a penalty. See instructions. The corporation is using the adjusted seasonal installment method. The corporation is using the annualized income installment method. The corporation is a “large corporation” figuring its first required installment based on the prior year's tax. enter the amount from line 11 on line 15. See instructions. . Enter amount, if any, from line 18 of the preceding column . Add lines 11 and 12 . Add amounts on lines 16 and 17 of the preceding column . Subtract line 14 from line 13. If zero or less, enter -0- . If the amount on line 15 is zero, subtract line 13 from line 14. 15. Then go to line 12 of the next column . Go to Part IV on page 2 to figure the penalty. Do not go to Part IV if there are no entries on line 17—no penalty is owed. shown on line 19 .
line for other income tax returns . *Use the penalty interest rate for each calendar quarter, which the IRS will determine during the first month in the preceding quarter. is imposed under section 1374(a), whichever applies. Caution: Use this method only if the base period percentage for any 6 consecutive months is at least 70%. Divide line 7 by 3.0 . Add lines 9a and 9b . amount in column (d) on line 3a . amount in column (d) on line 3b . amount in column (d) on line 3c . Add lines 11a through 11c . Divide line 12 by 3.0 .
amount from line 10, column (d) . Annualization periods (see instructions) . instructions for the treatment of extraordinary items . Annualized taxable income. Multiply line 21 by line 22 . Add lines 23a and 23b . Multiply line 29 by line 30 .
smaller of the amounts in each column from line 19 or line 31 . Adjusted seasonal or annualized income installments. Add lines 35 and 36 .